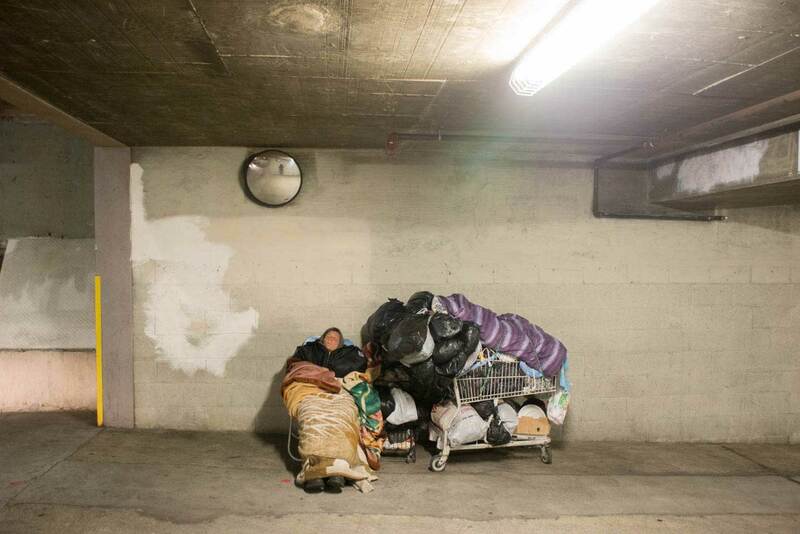 The sunny Los Angeles of popular imagination becomes a very different place after nightfall. 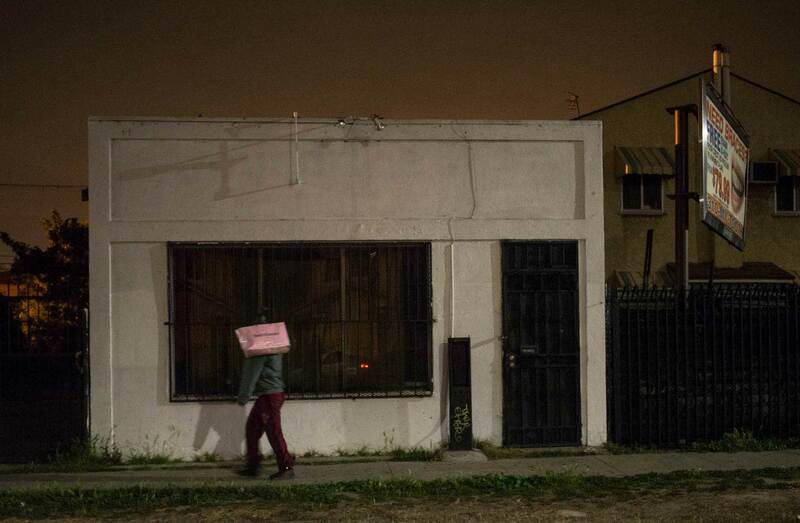 After 2 am, the city’s poorer neighborhoods become especially desolate and unfamiliar. The number of stray cats easily matches that of people on the streets. I have visited these neighborhoods and their residents during the daytime for decades, witnessing their evolving forms in detail. But this time, I wanted to allow my imagination to play freely with the city at night, to experience these neighborhoods in the darkness, at a time when dreams and reality may merge. Streetwalkers aggressively approached me as I stopped to photograph, forcing me to get back inside the car and drive off. One in South LA took me by surprise while looking at the photos I had taken. She placed her heavily made-up face inches away from mine. Lit from above by a streetlight, it looked like the face of a dead person. Freshly painted faces on murals, on the other hand, become intensely alive in the darkness. I am attracted to the growing number of images of minority heroes and heroines such Archbishop Óscar Romero, Barack Obama, and Frida Kahlo. 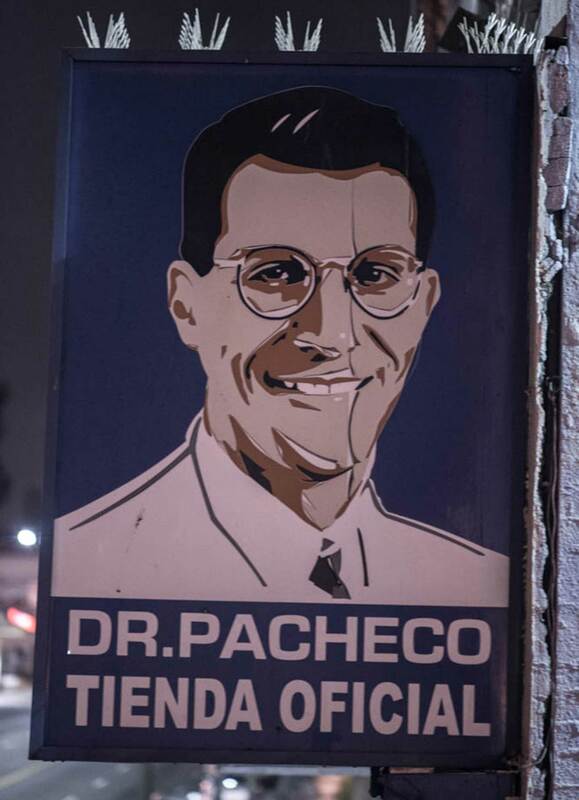 I am also attracted to the perennial Dr. Pacheco Naturalmente, purveyor of health and diet products, whose smiling portrait hangs above his store on South Alvarado Street, across from MacArthur Park, where it has been seen by hundreds of thousands of people over the course of some 10 years. I drove onto the sidewalk—something I would not do during the day—and from the roof of the car photographed this iconic alternative LA celebrity. An apparently homeless man passing by asked, “What are you doing? Why are you taking pictures of people?”—the portrait had basically become a person, and possibly the night helped animate it. 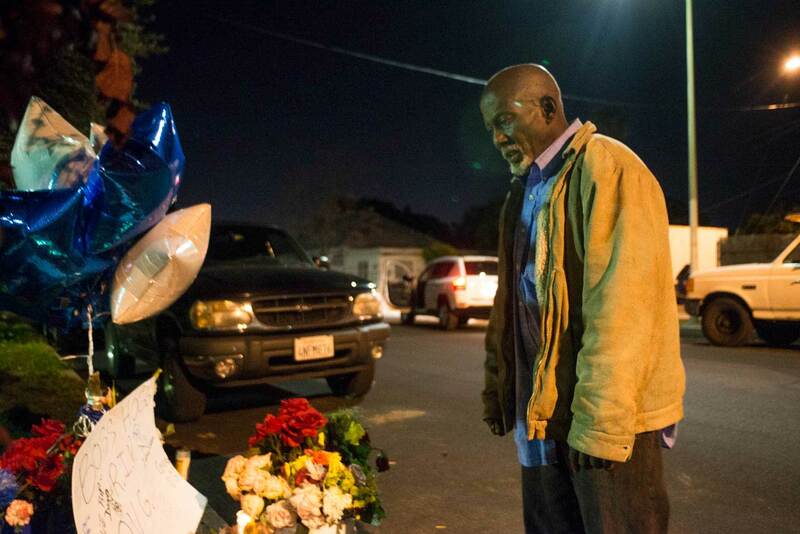 Memorials to recent victims of street violence are lit by candles. 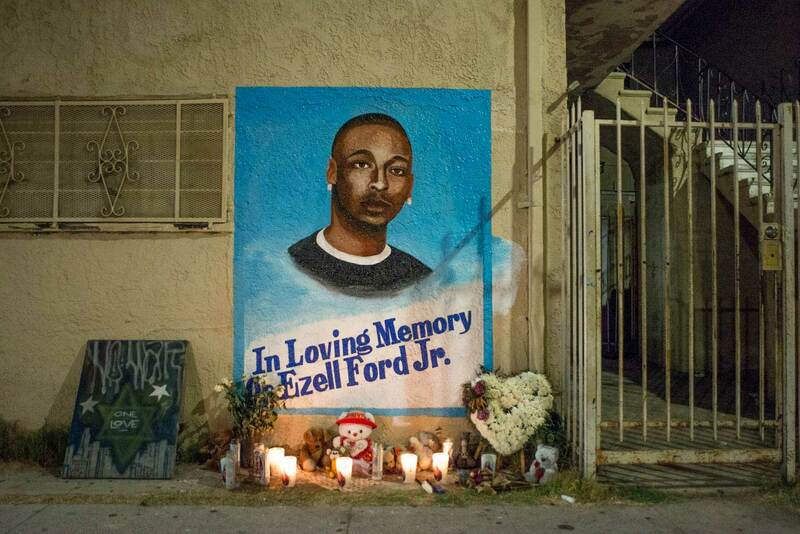 At 4:30 am, my photographic activity woke up a woman who lives next door to a memorial to Ezell Ford Jr., on South Broadway. Appearing on the balcony, she took it upon herself to inform me that Ezell was her cousin and that on August 11 of 2014 the police had shot him. Her voice, although calm, took me by surprise. In Pacoima, while photographing a memorial to “Boss Hogg,” I woke up his uncle Bruce, who was sleeping in a car across the street. Out of the blue, Bruce asked me for money to help bury his nephew, and I gave him a few dollars. 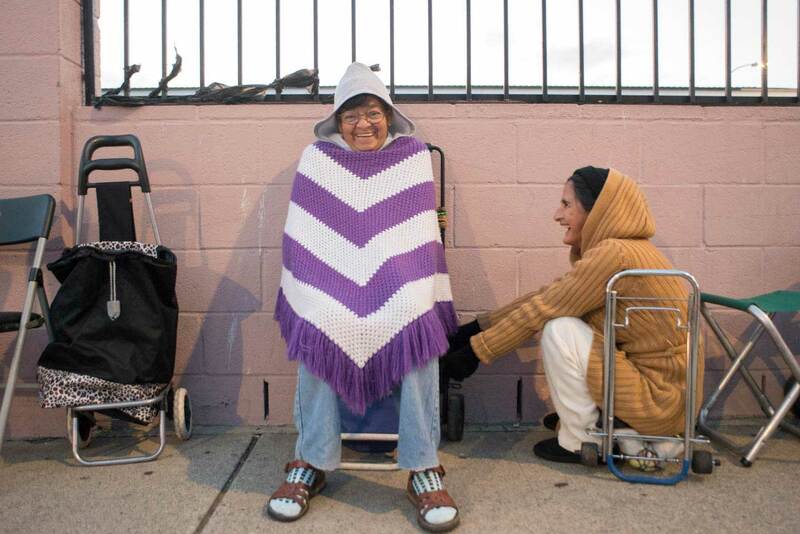 At 4:50 am, I encountered Antonia and Estela, who were waiting to get two bags of free food at the Church of Christ on South San Pedro Street. They explained that they had arrived there early in the hopes of getting a chicken, since the food pantry has only a few to give away. Los Angeles wakes up earlier than other cities. Food vendors wait at their posts, cooking for the breakfast crowd. As early as 4 am, people are waiting for the bus, ready for a long commute to work and to drop children off at day-care centers. 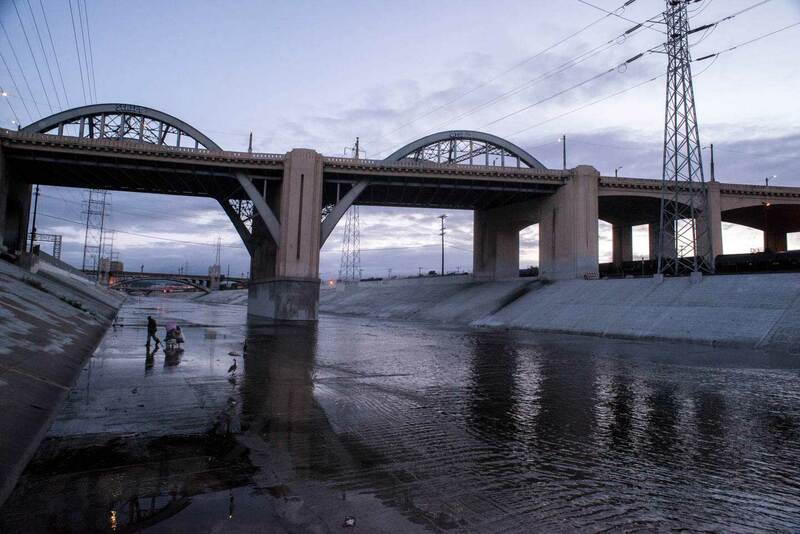 At 4:50, I drove to the LA River to see the dawn. A man named Will was collecting cans, taking advantage of the raised water level caused by the rain to catch them floating by. Although at first I was afraid of him, he asked me in a friendly way if I liked the rain. At 5 am on South Broadway, I encountered Javier, 43, originally from Jalisco, Mexico, another can and bottle collector. Javier is homeless and makes $20 a day collecting. 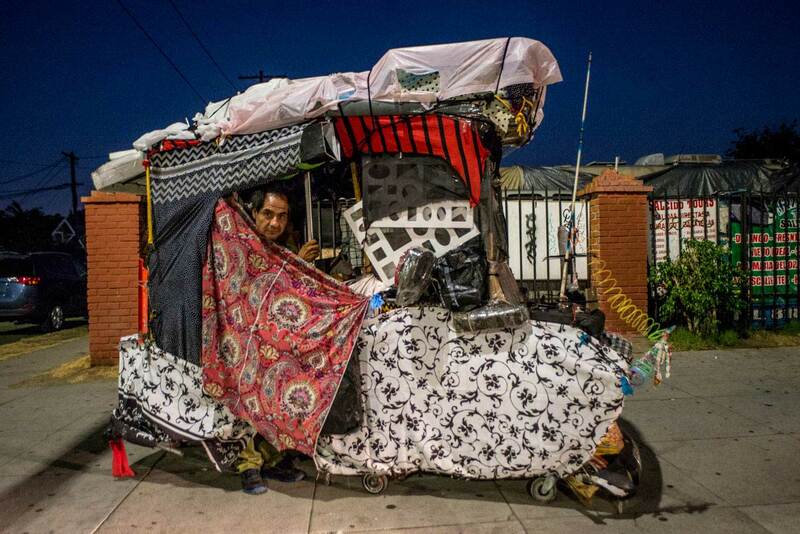 He assembled a vehicle for his work that consisted of several shopping carts covered with colorful rugs to protect against the rain and sun. During the day, he told me, amused children follow him as he slowly walks down the sidewalk in the middle of his conveyance, as if in a tank on parade. His brother, a construction worker, wants him to come live with him and get a regular job, but Javier prefers wandering. Worship starts early in the day, and at night there are vigils. 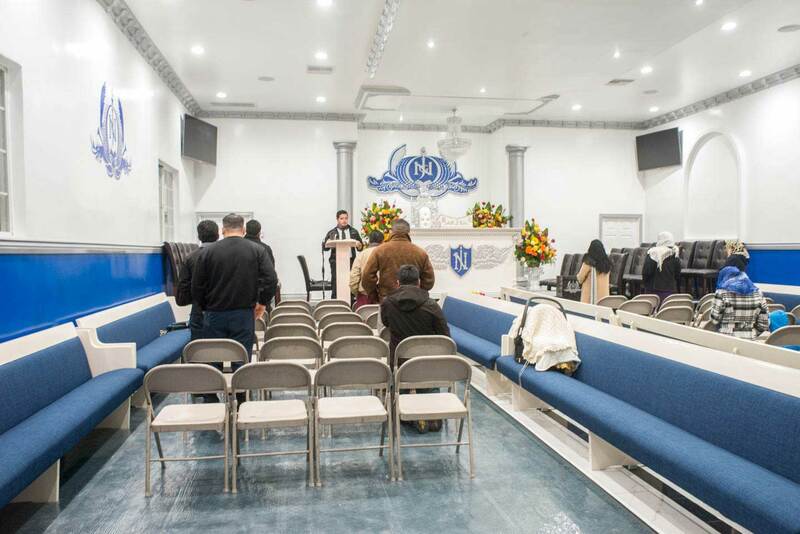 On Van Nuys Boulevard in the Pacoima neighborhood, Iglesia La Luz del Mundo opens for a service at 5 am. Inside, the minister preaches to a congregation of men on the left, women on the right. Camilo José VergaraCamilo José Vergara is a photographer and the author of numerous books, most recently, Detroit Is No Dry Bones: The Eternal City of the Industrial Age (University of Michigan Press, 2016). His most recent writing on Detroit can be found at PublicBooks.org. More of his work can be found at camilojosevergara.com.